I have a few pieces that have come from this line of clothing. 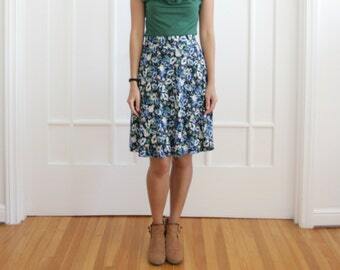 Regina designed and along with her master seamstress skills created the perfect skirt! I love the saturation of color in this skirt, the purples, pinks pop against the lovely white background.... plus it has pockets!! The material she uses for her line is very comfortable and it fits like a dream. I wear a medium with my waist is 28.5-29.5 and hips 39.5 with my weight fluctuating between 138-145 lbs. I am 5'5'' in height. I ope this helps someone if they are looking for measurement and sizing help. 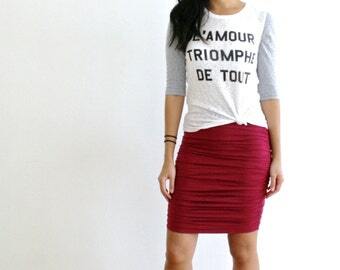 I do agree that this skirt works perfectly with the Sara top, another wonderful piece.. The older I have gotten I tend to wear skirts and dresses in the warmer months. You put it on and instantly you are dressed and looking fabulous!! Great sale price too!! !